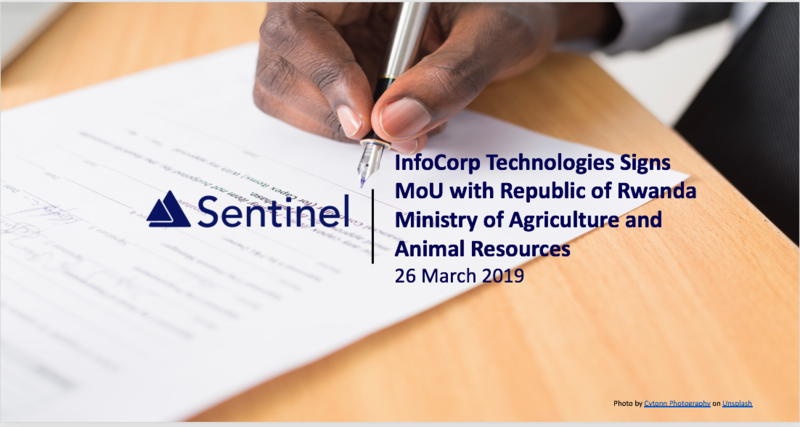 26 March 2019: Singapore-based InfoCorp Technologies and Rwanda’s Ministry of Agriculture and Animal Resources (MINAGRI) formalise relationship by inking Memorandum of Understanding. The MoU sets the overarching cooperative framework for InfoCorp to implement FarmTrek as a bespoke solution for Rwanda to reduce poverty amongst cattle farmers, especially those under the Girinka Programme, and facilitate more efficient access to livestock insurance and livestock-backed financing via digital payment. Stimulating economic activities and job creation in various subsidiary industries such as finance, mobile phones, and livestock feeds and fodders. The MoU is signed by Mr. Jean Claude Musabyimana, Permanent Secretary for MINAGRI and Mr. Roy Lai, Founder and CEO of InfoCorp Technologies. In the ensuing period, InfoCorp will be working with MINAGRI to develop bespoke solutions that meet MINAGRIs objectives. This includes deployment of FarmTrek Mobile to farmers with the coordination of MINAGRI, and also customisation of FarmTrek Business for specific users.